With the announcement of Super Smash Bros. Ultimate at E3 2018, our very own Editor-In-Chief Josh Speer has restarted his Smashing Saturdays! column that will run on Saturdays (when else?) up until (and possibly after!) the game is released in December 7, 2018. In each Smashing Saturdays! article, Josh will be covering the latest characters, trophies, music, items, and any other sort of Super Smash Bros. Ultimate announcements that Nintendo delivers! There will also be reoccurring segments, such as Josh’s Most Wanted Brawler, where he will explain who he thinks should be joining the Super Smash Bros. Ultimate roster, and why. So be sure to bookmark this page (we will be updating it weekly) to keep up with all the news! You can preorder Super Smash Bros. Ultimate NOW for the Nintendo Switch here! In this week’s installment, Josh looks at the new character videos for Luigi and Pac-Man, the strangeness of Ditto as a Pokéball spawn, the remix of Lost Painting from Castlevania: Symphony of the Night as a game soundtrack, a new assist trophy from Swapnote (remember that? ), and Josh reveals his Character of the Week! Josh goes in deep on the new videos for Shulk, Cloud, and Palutena, Marshadow’s Pokéball item appearance, the introduction of music from the NES-classic Mega Man 2, the return of the Green Greens stage from the Kirby franchise, and Josh reveals a Character of the Week that has been a long-time fan favorite! Fresh back from covering a convention in New York City, Josh takes a fresh look at the new character videos for Sheik, Greninja, Fox, Wii Fit Trainer, and Dr. Mario, the new assist trophy for Cap’n (Animal Crossing) and Zero (Mega Man), new music from Tomodachi Life and Fire Emblem, the Saffron City battle stage’s return from the very first Smash title and the Boxing Ring (and its alternative version) stage, the Pokéball item weirdness of Mimikyu, and Josh reveals a most unexpected Most Wanted Brawler. Josh goes over the two new character videos for Lucina and Lucario, the new Death Scythe weapon, the Moon from The Legend of Zelda: Majora’s Mask as an assist trophy, new music and a returning classic stage, and yet another Most Water Fighter from a classic third-party Wii franchise. Josh looks at the latest character videos for Isabelle, Ganondorf, and Pikachu, how Shovel Knight functions as an assist trophy, music from Animal Crossing and the classic Onett stage coming into the game, and announcing a very LARGE Fighter of the Week. Josh discusses the latest videos for Bowser, Toon Link, and Ryu, the return of the Pikmin Main Theme and the Ice Climber’s stage ‘Summit’, about how Isabelle is the newest announced fighter…and how Yoshi is the latest Fighter of the Week! Josh gives his experiences playing as Ridley during the Super Smash Ultimate demo presented at PAX West, goes over the new character videos for Ness, Peach, Wolf, Ike, and King Dedede, talks about the Main Theme from Yoshi’s Story being included alongside two new stages, and presents his new Most Wanted Brawler. With the Nintendo Direct this week that focused exclusively on Super Mash Bros. Ultimate, Josh discusses the character video for Samus, the character additions from the Castlevania franchise, the surprise announcements of King K. Rool, Chrom, and Dark Samus, new assist trophies and game modes…and Josh recommends a new Most Wanted Brawler to join the fight. In the midst of Evolution 2018, Josh looks at the character videos for Jigglypuff and Wario, the brand-new Fake Smash Ball item, a new song, the return of the classic Lylat Cruise stage, Rodin’s assist trophy…and a classic character takes center stage as the Character of the Week. Josh examines the latest character videos for Mii Fighters, R.O.B., and Captain Falcon; a new F-Zero soundtrack piece; two new stages…and recommends a very unexpected new addition for the Smash roster. Josh explores the latest character videos for Pichu, Bowser Jr., Bewear’s addition as a new Pokémon to the game, and restarts his featured Smash Character of the Week. Josh takes a look at the latest character videos released for Marth, Mega Man, Kirby and Pit, reveals the latest Pokémon and music announcements, and continues his Most Wanted Brawler segment with yet another surprise indie character. Josh explores the new character videos for Sonic the Hedgehog, Falco, Young Link, Pokémon Trainer, a couple new assist trophies, and restarts his Most Wanted Brawler segment with an indie character that has been incredibly popular since his debut. Josh goes over the new character videos for Corrin, Snake, and Donkey Kong, a soundtrack addition from Snipperclips, and a few new assist trophies (including one from a Famicon-exclusive game, Joy Mecha Fight). 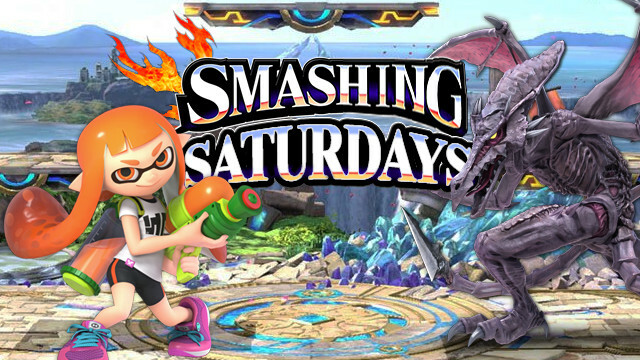 In this special Post-E3 Edition of Smashing Saturdays!, the series returns with a look at the character videos for Mario, Link, and Ice Climbers, a Splatoon soundtrack addition, the Bomberman Assist Trophy…and of course, the surprise announcement of Ridley. Keep sticking with this page, as we will keep updating it weekly through the release of Super Smash Bros. Ultimate on December 7, 2018!